In previous work we have developed procedures to analyse, compute with and reason about abstract matrices, that is, matrices represented with symbolic dimensions and with a mixture of terms and ellipsis symbols to describe their structure. A central component in this are the so-called “support functions”, which enable the representation of abstract matrices in closed forms. A key issue in making reasoning about such structures effective is controlling the complexity of the internal term structure of the closed form, which, in turn, hinges critically on the design of the support functions used. Our earlier support functions were simple, easy to work with and sufficient to capture arithmetic of general partitioned matrices fully. They explicitly represent each potential homogeneous region, usually a triangle or a rectangle, of an abstract matrix with a single term. However, adding or multiplying a sequence of matrices can result in exponentially many different cases of possible regions that have to be represented, and the existence of many of these is mutually exclusive. As this representation can become unwieldy in certain situations, we experiment with a different type of support function that allows us to represent only one of the possible cases explicitly, and have all other cases captured by the representation implicitly. 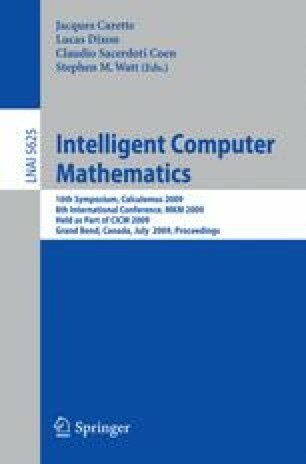 In this paper we discuss this new support function and develop the full abstract matrix addition algorithm for this representation. We show that we indeed obtain much more concise and intuitive closed forms, retaining the properties necessary for reasoning with abstract matrices and being able to recover the human readable region structure from the combination of abstract matrices under addition. This representation reduces the time and space complexity of performing K abstract matrix additions from O(N dK ) to O(K d N d ), for d the number of boundary directions (1 ≤ d ≤ 4) and N the maximum number of boundaries in any direction in the argument matrices.